Generally the Canadian Horse is black, but colors also range from bay to light chestnut. 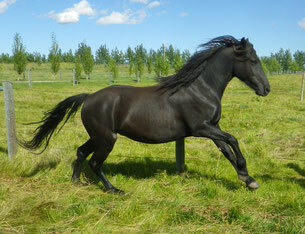 The stallion should weight 1050 to 1350 lbs and the mare 1000 to 1250 lbs. The desired height is 14 to 16 hands. As a general purpose animal, the Canadian Horse shows a well proportioned body, good setting of limbs, high quality of bones and good feet The forearm and gaskin are especially well muscled. The mane and tail are thick, long and wavy. The head shows intelligence, spirit and no excel of nervousness. The animal is generally very easy to handle. The Canadian's physical strength and docility make it ideal for farm work, driving, riding, hunter/jumping, packing and endurance riding. True to its heritage, the Canadian demonstrates its versatility by performing superbly in all equestrian disciplines. Willingness, adaptability and an even temperament make the Canadian ideal for use in competition, for working or as a family horse. Wherever they are shown, at the Calgary Stampede, Spruce Meadows, The Royal Winter Fair, St. Hyacinthe, or other exhibitions, Canadians are enthusiastically received. Truly a proud part of our heritage! The first horse to gallop on Canadian soil was unloaded in Quebec on June 24, 1647. The original stock was selected from the horses of Normandy and Brittany in France and sent to Canada by King Louis XIV. These original horses were of Andalusian, Arab and Spanish Barb stock. They flourished without influence over the next 150 years with no infusion of outside blood. Due to natural selection, only the strongest managed to survive the rigours of the winters. They became small in size, but the conditions under which they had to exist give them a hardiness to be found in no other breed. The Canadian is known as the Little Iron Horse and is still the sturdiest and the best acclimatized horse in Canada. These horses were much loved and appreciated by the habitant farmer and the numbers rose quickly. By 1850, the number of horses was 150,000 however the importing of other breeds and exporting to the United States for various wars including the Civil war meant the horse was in danger of disappearing as a distinct breed. Their only legacy might have been a contribution to the early bloodlines in the North American developed breeds: the Morgan, Standard Bred, Saddle bred and the Tennessee Walker. Under the leadership of Dr. J.A Couture, DVM, a few concerned admirers of the Little Iron Horse banded together to try and preserve what remained of the breed, their efforts produced a first stud book in 1886. Progress was slow however and it was not until 1895, when the Canadian Horse Breeders Association was formed that any real expansion took place. In 1907, under the leadership of Dr. J.G. Rutherford, the Federal Government livestock commissioner, a new stud book was started with improved standards. The number of canadian Horses had declined to under 400 in 1976, but has risen to over 2,000 at present. The Canadian breed is still considered to be on the critical list by the American Livestock Breeds Conversancy. The Canadian horse can be called a general utility animal. From the very beginning of new France, it was valuable not only for plowing, but also as a carriage horse. Breeders appreciated the qualities of strength, willingness and small food requirements. The breed is long-lived and still useful at an advanced age. The mares are extraordinarily fertile, and reproduce regularly until the age of 20 or older.